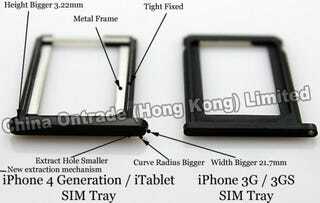 The SIM card tray you see pictured up top is supposedly designed for the Apple Tablet, and is built by Foxconn (the device's rumored manufacturer). It's definitely larger than the current iPhone SIM tray, but it could probably also be used anywhere. Either way, it goes on sale October 23 for $14.05.